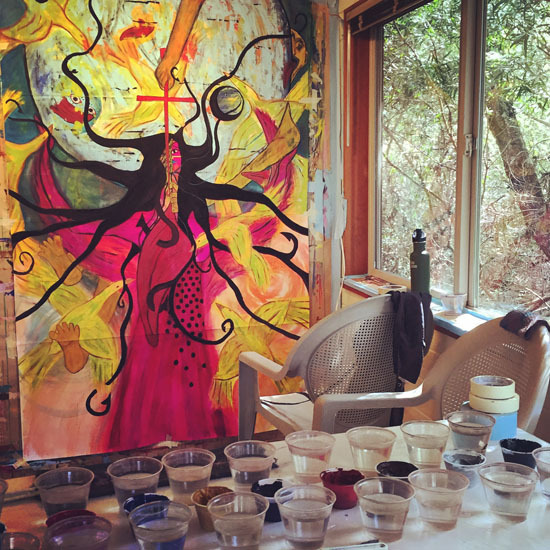 The Painting Experience Blog | Awaken Your Image Maker! If you don’t know where to begin a process painting, ask yourself: What would I paint if I really let myself feel? Sensing what to paint is so simple that we often disregard it. As you stand in front of your painting, what do you feel? Burdened? Light? Overwhelmed by the large space? Sad? Rough and bold? Intricate and detailed? Would it feel good at this moment to make a big scribble? Would a delicate brush appeal to you? Would painting a challenging image, such as a human form, interest you? 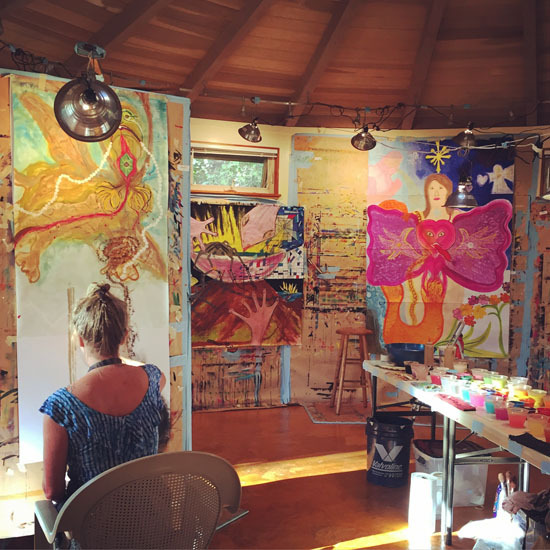 Process painting allows you to fully explore exactly what you sense. At each moment, your body knows the answer to these questions about what you feel. Once you are free of the limiting idea that you need to know what to do, you can sense directly, allowing all sorts of spontaneous images to arise. That is the first step. Then perceive these images through your body. Which one has more energy, more juice? Which image brings electricity to your veins as you think of it, which makes your heart beat a little faster? Dare to follow what your body says and see where it leads you. Make that the first step. Your being longs to manifest its uniqueness at all times; it will jump at the opportunity you give it and show you the way. This can only be experienced -- words will not take you there. We have the ability to sense and act directly, without thought. This ability is inherent and instinctual, but has been buried deep by education and acculturation, usually not surfacing except in moments of great stress or perceived danger. Yet it is there if we listen. Its voice may be quieter and less dramatic than the loud clamor of reactions and opinions, but it has an intelligent persistence that can guide us. It often seems too simple. To dip into a color just because you are attracted to it seems too easy. To feel the presence of an image waiting to be painted is dismissed as fantasy. To feel driven to complete the painting with hundreds of little strokes or dots is labeled compulsion. To repeat an image or a color on another painting is considered redundant. And to like your painting not for its prettiness or its ability to impress, but simply because you had feeling as you did it, is thought to be a waste of time. But is any of that true? Take the risk of following what naturally calls to you and see what happens. If you review all these images you have come up with, and sense them through your body -- not according to your preference or your ability to paint them -- which has the most energy for you? Which one has a special excitement about it, as if the brush would like to paint it? To further explore this topic and more, listen and subscribe to Stewart's series of monthly podcasts. You might begin with the episode Entering the Stream.